St. Luke’s Flower Guild Thanks You! 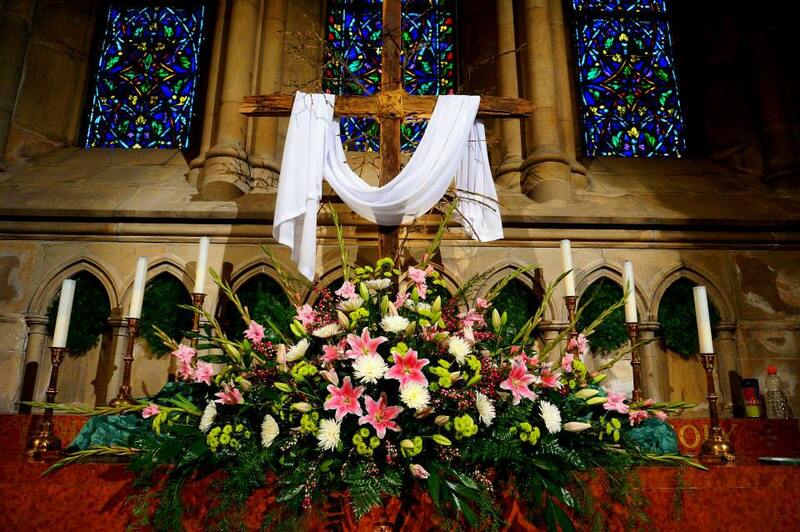 The Flower Guild thanks you for your generous contributions to the joy of Easter at St. Luke’s. Hours of preparation on Friday and Saturday by a first-class work team allowed for boundless beauty in our sacred space. On Good Friday, Bartlett’s delivered our materials, and Sue Villarosa foil-wrapped and watered all the 68 plants for the garden, while Monique Balsamo re-crafted the hanging baskets for the columns. On Saturday morning, Tim and Gordon led the transfer of plants from the Assembly Hall to the church by Meg Banitch, Ellen Alexander, Will Hobbie, and Nick Balsamo. Meg and Ellen polished the copper tubes that support the pew candles, as Nick cleaned them of wax from Christmas. The team then carted out dozens of blocks, bricks and stones for the Easter Garden, and installed the pew candles. Will and Nick hung the baskets on the columns. Alison Bolshoi and Lovie Abner arrived and arranged the Easter Garden with loving care, aided by Meg, Ellen, Nick and Will, plus Bella and Mariana. Myrna Bennett-Jackson arrived to help with the rocks and moss. Christina Bristol was busily arranging the flowers on the back tables (her first attempt at such large, beautiful arrangements!). Tim worked on the Narthex arrangement, and the Paschal Candle, and then finished up in the Assembly Hall. Gordon arranged a magnificent High Altar of white and yellow flowers that was an inspiration to us all. We were tired by the end of the day, but it was a good, healthy, and joyful tired. And the glory of Easter was revealed to all! THANK YOU TO EVERYONE!